Amul is one of the famous and successful companies in India. This company in the market sells various food products. Depending on the demand, an adequate supply of the products is maintained in the market. Not only this, but Amul is also engaged in distribution of its products through corporate franchise to every corner of the country. So that the Company reaches as many people as they can and deliver their delicious products. To sustain the market, the company is also engaged in enhancing its business by giving its franchise like other big companies. Even a common person can take Amul Company’s franchise. However, there are some rules laid by Amul for their company’s franchise. When a person is approved by any company to use their company name and products, and in return, takes monetary benefit in return from that person, then it is said that a franchise is been given by the said company. There are many companies across the globe who benefit by giving out their franchise, and in the same way, Amul is also trying to reach every corner in India to give its franchisee. In no time this company secured the first place in the dairy business in India and today the company sells many types of dairy and fast moving consumer goods in India and across the globe. 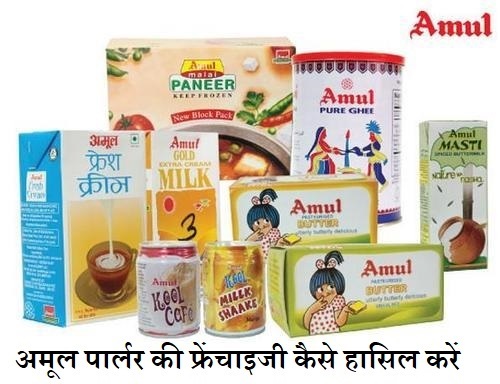 A lot of products are being sold in the market by Amul and these products are widely used by the consumers. The names of some of the products sold by this company are as follows. There are many companies in the market, which you can take franchise of, But Amul claims that if you take their franchise, then you will gain more profits in less time. Based on the location of the franchisee the company says that you can sell their products from 5 lakh rupees to 10 lakh rupees every month. According to the Company, anyone who takes the company’s franchisee will not pay any royalties or share any revenue to Amul. Therefore, taking Amul Company’s franchise can be a big advantage. Amul’s has a strong strategy to beat its rivals. Their marketing team has come up with has to give two types of franchise and you can choose any of the franchise type from both of these. Both types of these franchises are mentioned below. 1. Amul Preferred Outlet or Amul Railway Parlour or Amul Preferred Outlet or Amul Railway Parlour or Amul Kiosk. Amul has laid some rules to offer this type of franchise to Amul. Depending on the area and location amul has laid the following rules. According to the rules laid Amul Company, if any one wishes to take the Amul Preferred Outlet / Amul Railway Parlour / Amul Kiosk type franchisee. Then the person will have to start this franchise in a crowded location. According to the rules of Amul Company, such franchise can be opened around any railway station, market, school major educational institutions, hospitals nearby. Therefore, if a person wants to take this type of franchisee of Amul, then the person has to rent a shop near the place mentioned above. How big the store should be. To start an Amul outlet, a minimum of 100 to 150 square feet store is required. Therefore, while hiring the store, make sure that the area of ​​that shop is as much as the area that was set by Amul. Investments in Opening of Amul Preferred Outlet or Amul Railway Parlour or Amul kiosk. If you do not have enough amounts to take a franchise of any other company, then taking this franchise offered by Amul Company is a good option. Because this kind of franchise, which is given by Amul Company, costs only about two lakh rupees for investment. Out of these two lakh rupees, 25 thousand rupees are taken as non-refundable brand security by Amul Company. After that you will get one lakh rupees and 75 thousand rupees for the renovation of the shop and the purchase the required equipment. In this way, taking the franchisee, the total expenditure will be around two lakh rupees. Amul Outlet / Parlour / Kiosk (A variety of Average Returns on MRPs has been set on Amul products sold through SCR. If you sell Pouches Milk, you will get 2.5% average returns on MRP. On selling the products, you will be given 10% average rating on MRP, apart from selling this if you sell the Amul company’s ice cream, you will be given an average return of 20% on MRP. The second type of franchise which is given by Amul Company is Amul Ice Cream Scooping Parlour and by opening this Parlour you can sell ice cream made by this company to the customers. What is an Ice Cream Scooping Parlour? An Ice cream scooping Parlour is also a kind of shop where many types of ice cream are sold. In this type of Parlour, one can take the ice cream of his choice inside the cup or the angle and if you want to sit in the same shop, you can eat your ice cream. Shakes, pizza, sandwiches, burgers, hot chocolate drinks, coffee things are also sold in ice cream scooping Parlour. You can selecta shop to open ice cream scooping Parlour, which is built on places like a school, market and educational institute. Because Amul companyonly allows opening the scooping parlours in the places which are crowded and only then an approval is given to open their company’s franchise. How big should be the store? According to the rules laid by the Amul company to give ice cream scooping Parlour franchise, you have to have at least 300 square feet shop (this shop can be rented or to be rented to open ice cream scooping Parlour or Then you must be the owner). Apart from this, you can start your own Parlour even at any open space. To open an Ice cream Parlour, you will have to invest Rs. 6 lakh. Out of these six lakh rupees, Amul will keep Rs. 50000 as Non refundable security deposit. On the renovation of the shop, you will get up to 4 lakh rupees. The equipment (such as fridge, mixes, and ATs) will cost up to one lakh fifty thousand rupees and in this case you have to invest six lakh to open a scooping parlour. If you opt for Ice Cream scooping Parlour, you have to sell Amul products only. And the Company will give you a percentage of profit after you sell different types of products. The details of the incentive are mentioned in the table below. If you sell a pre packed ice cream product, you will get 20% more on MRP. In addition to selling Amul Company’s ice cream, if you sell other products prepared by Amul, in this Parlour, then you will be given an average return of 10% on MRP of those products. If you sell goods like Shakes, Pizzas, Sandwiches, Burgers, Hot Chocolate Drinks, Coffee and Amul Parlour, then sell them. You will get 50% profit on the sales of these similarities. So, try that you sell burgers, coffee and all kinds of shakes as much as possible through your Parlour. Because doing so will only increase your profits. If you choose any type of franchise from the above mentioned franchises of Amul. Amul Company will help you to set up that franchise, as the company can help you in the opening of the store or the Amul Company can assist you in buying the equipment. So that you do not have any problem opening the franchise. The shop you choose to open Amul’s franchise. You will have to make that shop according to the manner and design as suggested by the Company. The company will keep aside the money that you give as a brand deposit to the Amul Company, and the company will continue to deposit it for a year. If you close this franchise in the middle then you will get these money only after one year. You do not need to buy the products of this company from anywhere else after taking the franchisee of Amul Company. Because the wholesale dealers of Amul Company will come to your shop and give you Amul Company’s products and you will have enough time to do this. At the time of opening an Amul’s franchise you will have to hire some people and you will have to pay the income of these people from your profits. Therefore, you only hire as many men for whom you can easily pay off at the end of the month. Amul Company is already a known company. So, after taking this company’s franchise, you will not have to do any kind of promotion for your Amul shop i.e. franchisee. But when you open your Parlour in an area, you may need to give information to the people of that area, which costs a little. However, according to the rules of Amul Company, Amul Company will also help you in this kind of local promotion. How much will it cost you to open Amul’s franchisee? The information is given above. With the help of which you can accurately predict how much amount you will need to open the Amul franchise. If you have a shortage of money to open Amul’s franchise, you can take a loan from any bank. In order to get a loan, you will have to collect some proof and any kind of land documents in the bank. In order to take Amul’s franchisee you must first go to the official website of this company at http://www.amul.com/. You will see Amul Parlour on the bottom right side of Amul’s site and you will have to click on Amul Parlour. After clicking on Amul Parlour, a new page will open and on that page you will find all the information related to opening Amul Parlour. On the Amul Parlour website, you will see the third option called ‘Online Form for Amul Parlour’ and you have to click on it. After clicking on the online form for the Amul Parlour, a new page will open and you will be asked to fill in some information from that page. After filling the information, you will see the submission submitted at the bottom of the same page and you click on it. This form is related to opening your Amul Parlour and will be submitted along with the click. A few months after the form submission you will get the phone call from the Amul Company and you will be told about the further process and after doing the correct procedure, you will get the Amul Company’s franchisee. 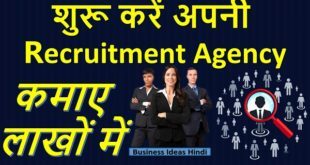 Amul Company is one of the oldest companies in India, which is also known globally and in such a way, it will only benefit you to join Amul Company. Working with this company will enable you to get many information related to dairy business, which will be beneficial for your future ahead. I want to Take Amul Franchise so I want to Know What will be the Procedure . So Please tell me i am interested to invest here . So Kindly explain the Process.